Book it! With quarterback Joe Viviano (4) signaling, Charlie Booker headed for the end zone. The 27-yard bolt gave the Crimson a 7-0 lead. Ryan Halvorson (85) clutched the pass from quarterback Joe Viviano. The third-quarter toss (and Jake McIntyre's extra point) drew the Crimson even, 14-14. Langston Ward (92) and Chase Guillory (45) were among the Crimson defenders making a Bulldog sandwich out of Yale’s mighty-mite running back Alan Lamar. Read a view from the sidelines here. 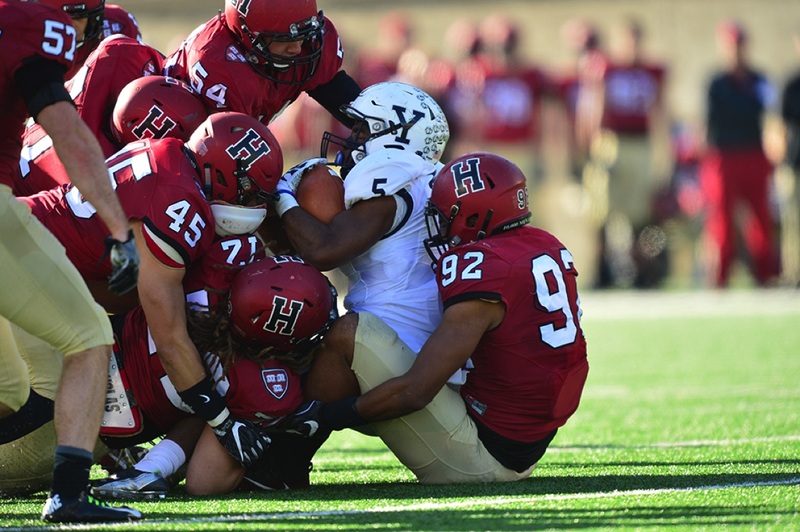 Harvard’s football team proved that adage this past Saturday, losing The Game for the first time in 10 years when it was beaten by fired-up underdog Yale 21-14. The Crimson finished its season at 7-3 overall and 5-2 in the Ivy League; the Elis closed at 3-7 overall and 3-4 in conference play. 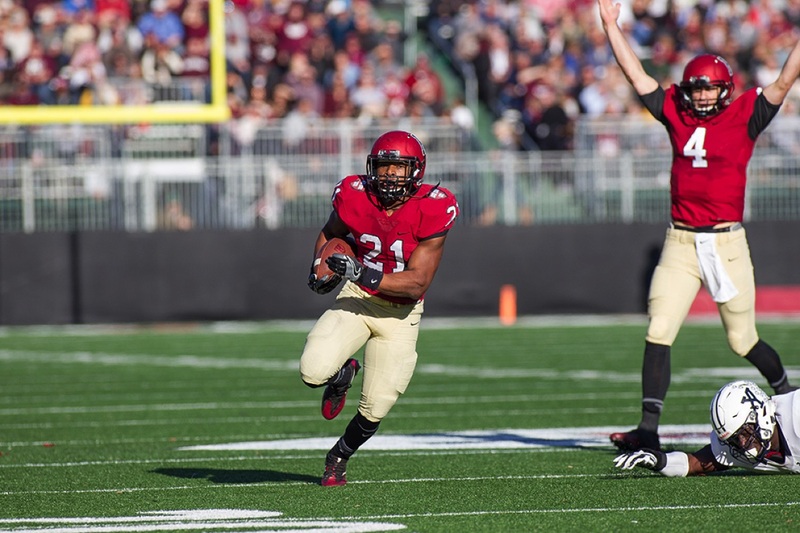 The defeat in the rivalry’s 133rd edition kept Harvard from a fourth straight Ivy title, which was shared this year by Princeton and Penn. Yale coach Tony Reno, noting that his team now “has a one-game streak,” was justifiably exuberant over his first victory over Harvard in his five years as the Elis’ head coach. “We played hard, we played fast, we played physical,” said Reno, a former Murphy assistant. To which we’ll add: They played smart. In some statistical ways, this was one of the most remarkable Games in history. On a balmy day before a rare sellout crowd, there was another rarity: only one turnover was committed, and that came when Yale recovered an onside kick to open the second half. There was neither a fumble nor an interception. That was testament especially to the ball-control game of Yale’s freshman quarterback, Kurt Rawlings. Making only his fourth start, Rawlings played like a wily veteran, throwing mostly quick, low-risk passes. He completed 17 of 28 but (more importantly) kept them all out of the hands of Crimson defenders. Rawlings also gained ground with option runs and scrambles, finishing with a net of 7.4 yards per carry. On the other side of the ball, the Elis rarely let Harvard’s vaunted passing attack get in gear. In the first quarter, quarterback Joe Viviano ’17 tried only one pass (an incompletion). “We had to get the ground game running,” explained Murphy. ‘We felt like we’d ease into the pass game today.” Viviano ended up completing 17 of 28 for 181 yards, far below the 247.7 average the Crimson had entering the game. The early action was dominated by the two punters, Harvard’s Zach Schmid ’18 and Yale’s Alex Galland. In the first half, there were 11 punts (six by Galland), many of them pinning the foe in the shadow of its goal line. It took a while, but the Crimson was the first to break through. Viviano hit wideout Adam Scott ’19 for a 28-yard gain to the Yale 27. On the next play, Viviano handed the ball to running back Charlie Booker ’19, who was seemingly halted. But Booker bounced off a Bulldog defender and ran down the sideline into the end zone. Jake McIntyre ’20 kicked the extra point. Harvard 7, Yale 0. Yale was resilient. The Elis went 10 plays in four minutes and 18 seconds. The highlight was one of the most ingenious plays of the season. Facing fourth and four from the Crimson 19, Reno sent in the holder on his field-goal team, Andrew Johnson. Johnson lined up right behind center, took the snap, ran toward the line—and flipped a jump pass to receiver Leo Haenni, who snatched it just before it hit the ground. Said Murphy later of this play, called “Full Polecat”: “We practiced against it and we just got sucked in.” Four plays later Alan Lamar ran a yard for a touchdown. Galland kicked the extra point. Harvard 7, Yale 7, at the half. 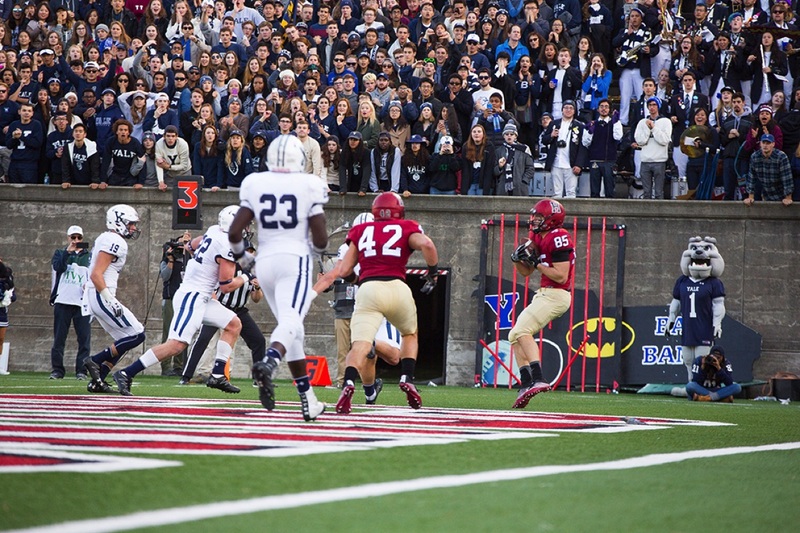 More smarts came on the second-half kickoff, when Yale caught Harvard off guard with an onside kick. “We felt it was a really good opportunity for us, so we took a shot,” said Reno. The kicker, Blake Horn, dribbled the ball the required 10 yards, then jumped on it at the Harvard 49. The Elis needed only four plays to cover the distance to the end zone, the capper being a 28-yard toss from Rawlings to fellow freshman Reed Klubnik. Galland added the point-after. Yale 14. Harvard 7. Now it was the Crimson’s turn to demonstrate resiliency. Viviano took his offense 84 yards in 10 plays, the two biggest being a 36-yard toss to tight end/H-back Anthony Firkser ’17 (till then an invisible man) and a 34-yarder to wideout Justice Shelton-Mosley ’19 that brought the ball down to the Yale 2. On third down, Viviano found tight end Ryan Halvorson ’17 in the end zone. McIntyre again added the point. Harvard 14, Yale 14. Then came a tale of two opportunities, one squandered, one cashed in. Pinned at its three-yard-line after another artful Galland punt, the Crimson mounted a 16-play drive at the end of the third and the beginning of the fourth quarter that consumed nearly seven minutes. It ended in a 35-yard McIntyre field-goal attempt that missed—wide left. Rawlings then led the Elis on a nearly seven-minute drive of their own. Harvard simply couldn’t hold them. On third and goal from the Harvard three, Rawlings hit Klubnik for the game-winning touchdown. Galland booted the point. Yale 21, Harvard 14. Four minutes remained, but in two possessions the Crimson never seriously threatened. Coming up: The winter of our discontent, followed by the kickoff of Harvard’s 144th football season, on September 16 at Rhode Island. Tidbits: The rivalry now stands at Yale 66 wins, Harvard 59 and four ties….Tim Murphy’s record in The Game is 17-6…The Harvard seniors (Class of 2017) ended with 35 Ivy League victories, one shy of the most since the league formally began play in 1956. Their brethren of the Classes of’15 and ’16 each had 36.